With the help of Jeri Bell, employment specialist at One Vision, Steven toured many different potential places of employment. He knew he wanted to work in food service, though, and Jeri made it her goal to take him places different and unique. Ultimately, the pair visited Diamond Jo Casino. 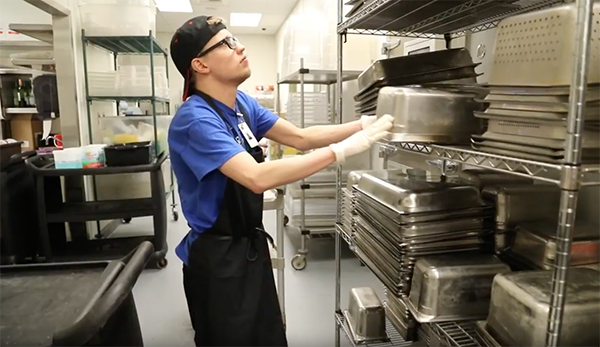 They toured several areas of the facility including the gaming floor, security, the Woodfire Grill, and more, but when Steven saw the massive dishwasher in the kitchen, he knew where he wanted to be. Though he currently works with the assistance of a One Vision job coach, Steven said his goal is to one day work on his own. “They make me feel important here,” he said.